Buy this item and earn 50 ClubPoints. Note: This product is approaching its end of life (EOL) and is available while supplies last. Sale is final - this item is not eligible for returns. 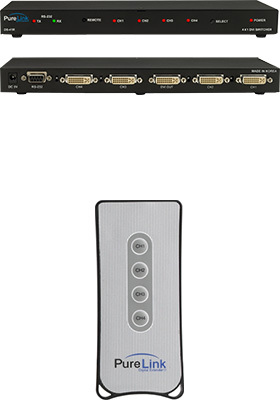 PureLink™ 4-in-1-out DVI switching system allows multiple HDTV sources or DVI computers to share one HDTV (or DVI) display utilizing the DVI digital to digital connection for superior HD performance. PureLink™ DS DVI switching system is HDCP compliant, comes with wireless IR remote control and RS-232 input for home network systems like Crestron, AMX, and others. PureLink™ DS DVI switching system features the highest quality and state-of-the-art performance for your home theater. HDCP (High-bandwidth Digital Content Protection) is a standard encoded into the video signal to prevent it from being pirated. If a source device is HDCP coded and is connected to a HD display or projector without the proper HDCP decoding mechanism, the picture is relegated to "snow", or in some cases to a very low (480P) resolutions of the images. In order to view HDTV with HDCP compliance at its original high-resolution, both the source, the display and any device in between must enable HDCP decoding. PureLink products are guarantied to be 100% HDCP compliant on every single output port.